Ocho Palmas is truly a jewel of a Caribbean Villa. This enchanting four bedroom luxury villa with sprawling decks and private infinity pool commands a paradisaical view of the Caribbean. 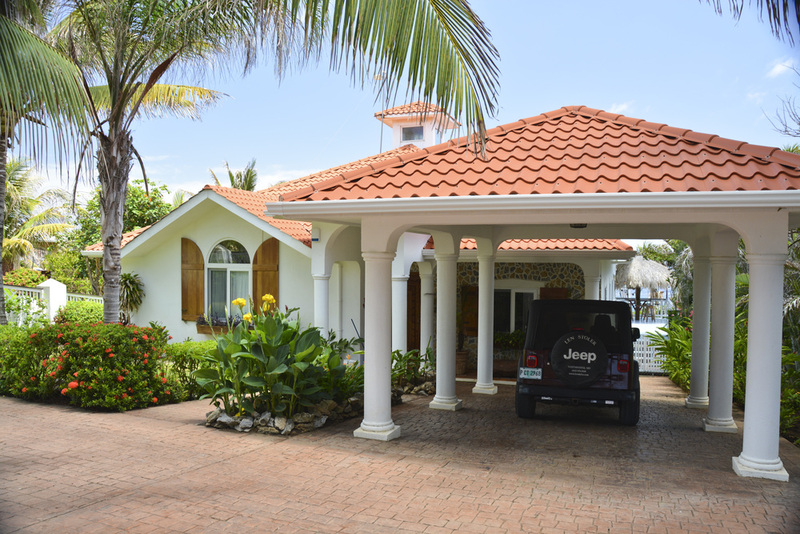 Located at the Western most tip of the Roatan in Lighthouse Estates and owned by Antrim 1844. Imagine your family and friends basking in the Caribbean sunshine listening to the sea lapping against the backyard while you float in the private infinity pool. The colorfully lush tropical vegetation is a haven for butterflies and hummingbirds while fishing and dive boats occasionally meander by. Facing East, sunrise from the expansive veranda is a daily marvel. The beautiful decor and attention to details in Ocho Palmas sets it far above other houses. The elegant fabrics, handcrafted Honduran furniture and artwork make you feel at home...all the comforts of home in a carefree Caribbean Adventure! This luxurious four bedroom, two bath home offers both indoor and outdoor amenities. Relax on the expansive veranda under the shade of wild palms and cooling trade winds or soak up some sun on the pool side deck. Dine outdoors or escape to an afternoon siesta on the pool side cabana. Wall over the hill to one of the Top Ten Most Beautiful Beaches in the Caribbean (Conde Nast Traveler). Only the crystal clear depths of the sea surpass the 85 degree water temperature. The scuba diving and snorkeling are some of the finest in the world as the second largest natural coral reef barrier surrounds the Roatan. The sea life and tropical wildlife are breathtaking. Ocho Palmas is a fantastic home for those looking to enjoy the world's top beaches, yet offers the peace and serenity of a private home. Stroll 100 yards from the house and enjoy the sunset from the secluded shored of the stunning private beach at the Lighthouse Point. This living area of Ocho Palmas is an open design with a spacious gourmet kitchen featuring a large center island, stainless steel appliances and granite countertops, comfortable living room and bar. The veranda offers guests a dining room for ten, surrounded by comfortable lounge chairs and a gas BBQ which is steps away from the pool side deck and cabana. Continental and Delta offer direct flights from BWI to Roatan! Round trip flights leave every Saturday so you can leave Baltimore in the morning and be in Roatan by early afternoon.